This is just an archive page now. For our latest news, please see our Facebook page. If you would like to be kept up-to-date with news from St Saviour's Church you can subscribe to our magazine or email list (enter your email address above). We've been recording the occassional service for a while now, but we are now going to try to record all our 9:30am services and put them onto the website. You can find them here. We've also bought a new cordless handheld microphone, which the Manor School children have been using; they got on with it so much better than the old microphone. We've been too busy to update our news page recent; sorry about that. We might try to backfill some of the pages if we get time! We had a great summer with lots of visiting priests. We were very fortunate and it was nice to have such variety. It was great to see our friends in the old partnership and to have visits from Stephen Newell (from Zion), Bishop Mike and Simon Jones (our Area Dean). We're now looking forward to welcoming Reverend Colin back and hearing what he has been up to. On 22nd September Simon Jones led us in our Harvest Service with a very interesting sermon. The Manor School service was the next Wednesday and on the Thursday Sophie and Edward helped us to take all the goods down to Bristol. 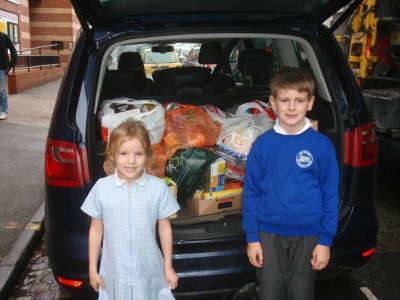 We filled the boot of a large car - and put a dozen more bags under the children's feet. Usually we take the tins to the Sisters of the Church and the fruit/vegetables to the Salvation Army. Unfortunately the Sisters of the Church are closed on Thursdays and not open again until Monday, so (as some of the food was perishable) we just went to the Salvation Army in Ashley Road, a few hundred metres from the Sisters of the Church. The Salvation Army used to run a canteen for homeless people, often feeding over 100 people a day, but in the 30 years they have done that the number of places providing meals for homeless people in Bristol has risen from 3 to 30. So they now just run a food bank. It seems that this food bank is on a much smaller scale than the Sisters of the Church and the harvest goods from the Manor School and St Saviour’s probably doubled their stocks, so it was all warmly received. They asked us all to pass on their thanks to everyone for all the food you brought. 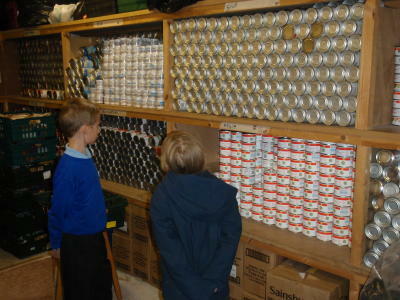 Sophie and Edward were shown round the building and saw the store-room where all the tins ended up. 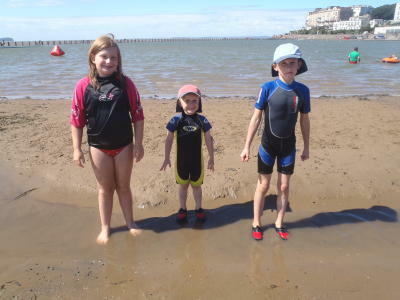 On Sunday 18th August the children went on their Sunday School outing - to Weston-super-Mare as tradition has it! They came to the beginning of the 9:30am service and left after the second hymn to catch the train from Parkway (works taking place on the line from Yate). 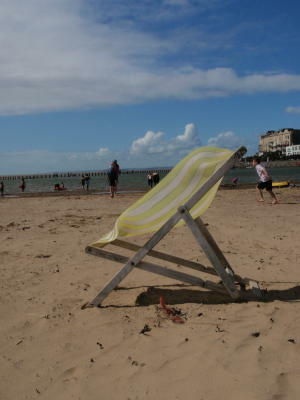 It was a nice day in Weston, sunny but a bit breezy. 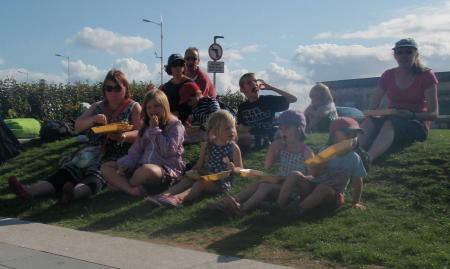 We sat on the beach by the Marine Lake, had lunch and played for a while (with a beach ball that found us and we could not loose - the wind and other people kept returning it even when it blew over the seawall onto the prom). The water rescue dogs were swimming at the other end of the lake, to raise money for the RNLI, so we went to have a look at them. Sadly it was all too soon time to go home, so we bought some Fish and Chips for supper. Our train was packed and we struggled to get seats. We were also late getting into Templemeads, but luckily we had 20 minutes scheduled to get our connection. So off we hopped from our train - only to find out that we were on the same train again up to Parkway. Quite why they stop one service and start another (yet some trains go straight through), I don't know. Anyway the train was packed and... we struggled to get seats!! Nonetheless, a great time was had by all. The children (and I) had a busy summer, with Mary Head keeping us occupied with lots of activities; many cleverly leading up to the Horticultural Show and some excellent entries for the children. 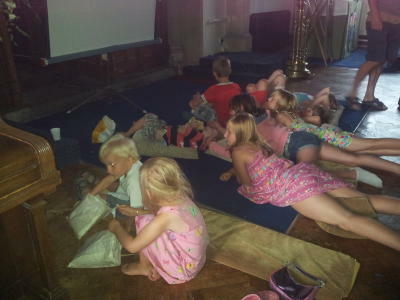 The Sunday school also had a film club when we watched Evan Almighty, ate popcorn and had Fish and Chips afterwards (yummy). 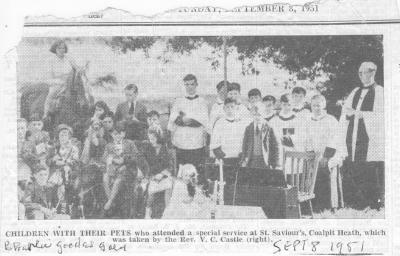 Ann Moulsdale very kindly let me take a copy of a press cutting she had made in 1951 of a Pet's Service at St Saviour's Church. This took place outside, in the [old] vicarage gardens with Rev V C Castle. Ann attended on her horse, Charlie. A large version of this photo can be seen with many others, in the album at the back of church. Thank you Ann. 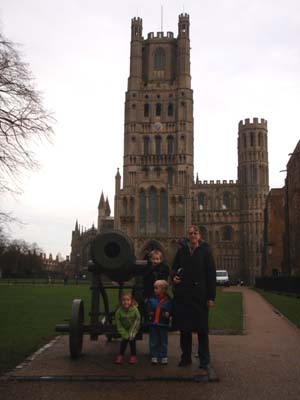 As you may have read in the magazine, I paid a visit (with Sarah, Thomas, Sophie and Matthew) to Ely Cathedral on the way back from a visit to Ipswich to see my parents. 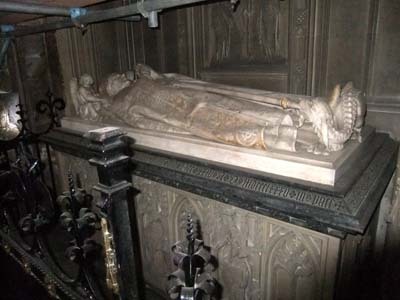 I was on the trail of Bishop James Russell Woodford, who was the first vicar at our church from 1845-1848. I won't repeat the article, but if you have not read it, it is in the February 2013 parish magazine (page 23). The famous Octagon Tower and Lantern. 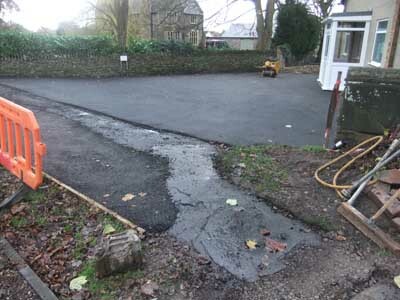 Thanks to Gordon's fine work we have a lovely new tarmaced drive to the hall. "This church was re-decorated during November & December in this year of our Lord 1955 by Frank E. Sully and Bill Fourd in the employ of K.G.S.Monk, Decorator Wick, Nr Bristol. 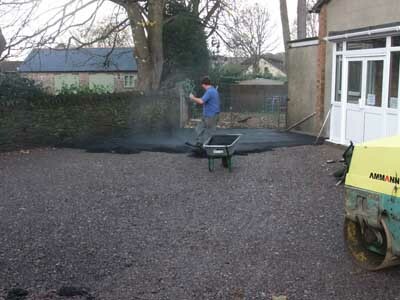 Contractors were W.J.Hembrough & Sons, Warmley, Nr Bristol. 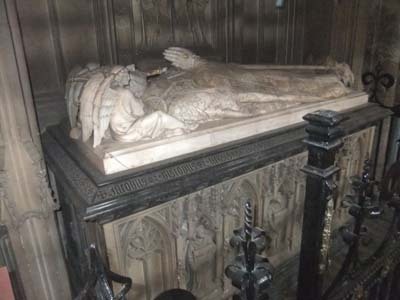 Architects Burrough & Hannam, Bristol Rector: Canon W. Kingsley-Martin. The roof was cleaned, inspected & treated for Woodworm. 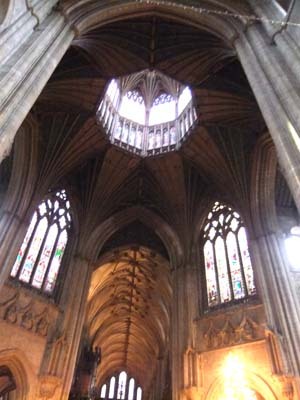 All walls were cleaned and given one coat of paint and one coat of Walpamur." It is our 167th birthday on 9th October and so we are having a big celebration on the weekend of 6/7th October. 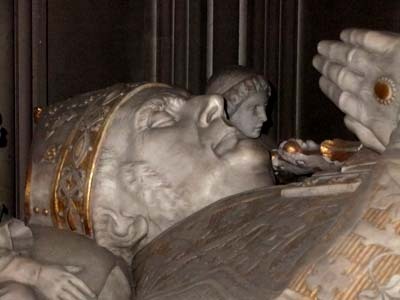 Do join us; the church is open from 10am-4pm on the Saturday with a Jubilee Memoribilia Exhibition in the hall from 2pm-4pm. 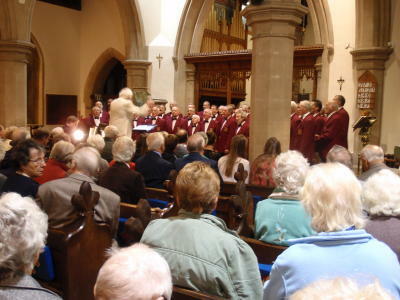 The concert by the Dursley male Voice Choir and Soloist Kirsty Halsam is not to be missed. Tickets £8; starts at 7:30pm. 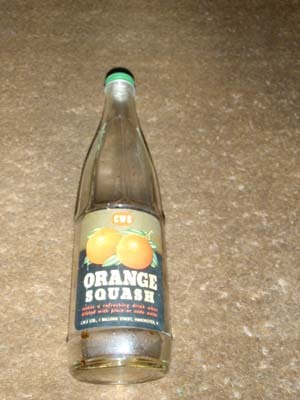 We will also have on display a "Message in a Bottle" that we found recently in the church dating from 1955! On Sunday we have two special Dedication Services at 9:30am and 6pm. For more information see our poster and events page. 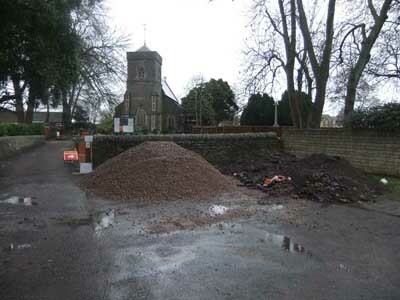 Thank you to those of you who have already given some lovely gifts to the church; they will be put towards the maintenance of the Churchyard, including the rebuilding of a collapsed section of wall and re-tarmacing part of the driveway. A big thank you to Dyson Insulation and Scottish Power (our Church Electricity Supplier) who generously gave us several rolls loft insulation to help keep the Vestry warm. Our church house group for Bible study and prayer has recently been studying and discussing St Paul's Letter to the Colossians. It is only a short letter, but there is a lot to discuss! Paul wrote it in the middle of the first Christian century, in a culture very different from our own. It is a challenge, but a worthwhile one, to try to think ourselves into that culture and to see what he might have been saying to his audience. And then to think again about our own day and ourselves and see what speaks to us in our situation and culture. In writing to the Colossian church Paul shows his great passion and earnestness. Although he hasn't actually visited Colossae and doesn't know the people there personally, he does show great care and concern for their well-being and their faith development. Colossians includes some marvellous verses, including that great hymn about the pre-eminence of Christ that begins: 'He is the image of the unseen God, the first-born of all creation...', and the pertinent exhortation about looking up: 'Let your thoughts be on things above, not on the things that are on the earth, because you have died, and now the life you have is hidden with Christ in God.' It is particularly helpful to see these verses in context, to think about why Paul uses certain phrases, and to imagine the impact on those whom he was writing to, as well as to let the words sink in our own situation. Our house group meets approximately fortnightly on Monday evenings at 8.00 p.m. in the Vicarage. You would be most welcome to come along and join in. 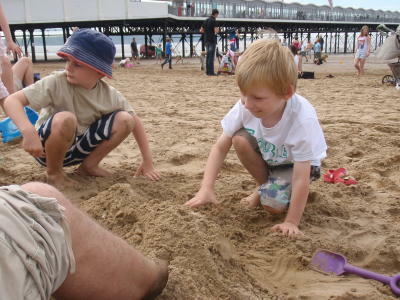 We had a great trip to Weston-super-Mare again this year. We left the church service after the first hymn and caught the train from Yate station. 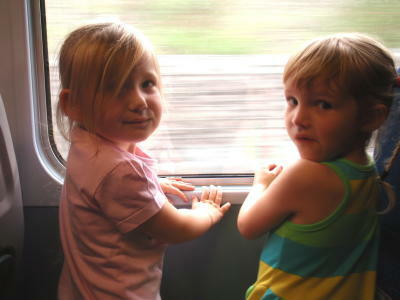 We waved to the school and church as we passed by on the train, then played Eye Spy and lots of other games. The weather was kind to us as it was nice and sunny, but the tide was out, out, out again! We had a walk along the seafront and round the pier (pretending to be a pirate and have our photo taken on the way). Then we had lunch (Fish and Chips!) 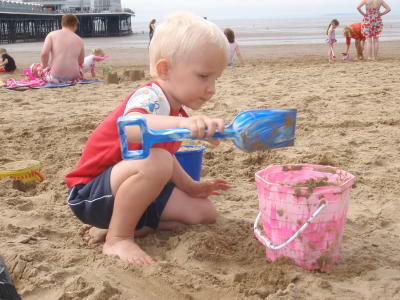 and made sand-castles. 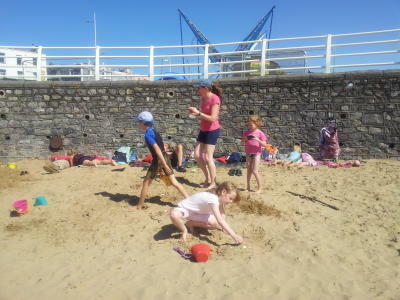 After that we went for a long walk to the Northern end of the beach and watched lots of people crabbing, then we found a brilliant, massive paddling pool (big enough to swim in), called Marine Lake. We saw Birnbeck Island and the RNLI station, then went back for a paddle in the lake. Sadly it was soon time to go home, but we had tea and fun on the train. 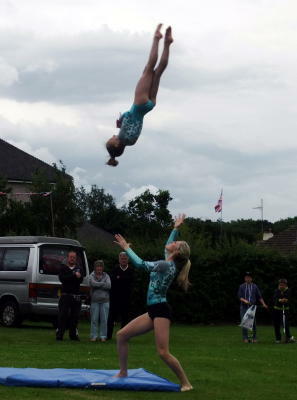 This year some of our children went to two holiday clubs. They had a great time. The first was held jointly with Zion and St Peter's Churches. There are lots of photos! The club was called 'On Your Marks' and was based on the Olympics so had a very sporty theme. I wonder who can remember the Memory Verse or Theme Song?? The other holiday club, held at All Saints', Winterbourne Down is still in progress as I write, so you will have to wait for photos. Thanks to all the organisers who helped run the clubs. I think the children had a wonderful time. I hope you managed to come along to our Summer Fayre. 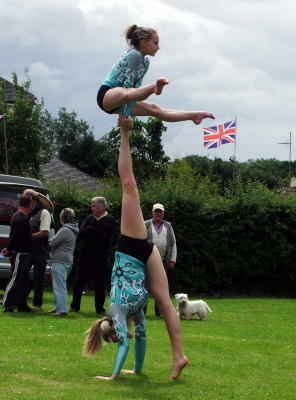 If not you missed a spectacular display by King Edmund Acrogymnastics Club. You can see some pictures below. Make a note in your diary; they might be back next year. 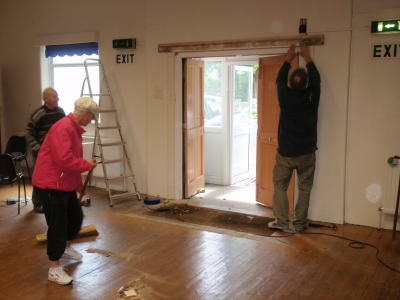 I am really excited to say that at the workparty this morning we removed the inner lobby in the Church Hall. 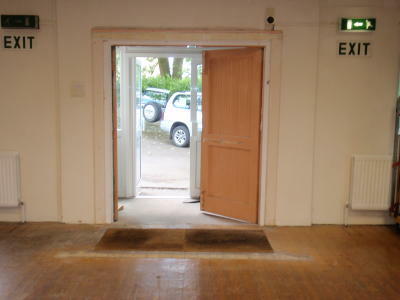 Since the porch was added to the outside of the hall, the inner lobby is no-longer required. 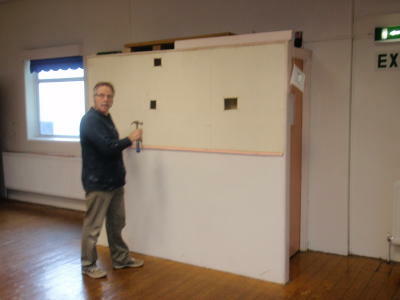 It took 6 of us 5 hours to remove it, dismantle, remove all nails and make good the wall/floor. There is a little bit more to do to tidy up the decoration, but that can wait till next week. 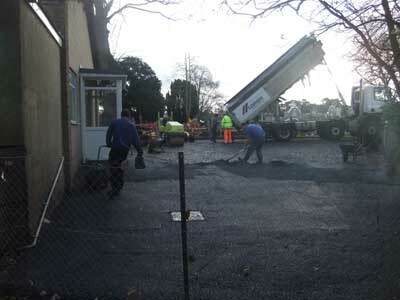 I am not sure if the reason for removing this was to make better access for wheelchairs or to make room for another bowls mat, but it looks very good now! I had the job of removing all the nails from the wood (so we could reuse it); there must have been several hundred nails. We swept up several times, but if you are there for breakfast club (9:15am tomorrow), the floor may still be a bit dusty, so please dampen down a few kids and sweep them round the floor to tidy up. Our next Monthly workday is Saturday 14th July - not long, just 9am till midday (though Gordon and Sean are there most weekends!). Roof off. Dust in the air (bright spots)! Gordon supervising. We did clean up lots, but still the floor was dirty! Thanks to everyone - including Trevor who was busy cutting the grass. 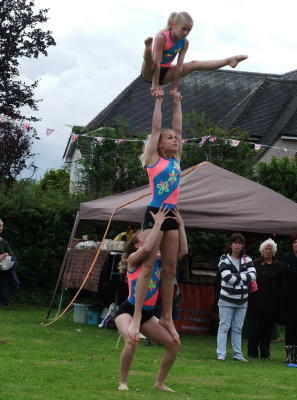 Wasn't that a great Jubilee celebration on the Centenary Field; well done to Louise for her help with the organisation. The end of April saw our Church AGM. Thanks to Mary for being a Churchwarden for the last 6 years and all the hard work she always does. Thanks too to Jessica (our organist and Musical Director) for replacing Mary and becoming a Churchwarden alongside me. Thanks too to Mike, who steps down from the PCC after many years of service on that and as Churchwarden. Thanks too, of course, to everyone else who helps out around the church. We now have a Geocache in the churchyard. Geocaching is an exicting sport where you are given a grid reference and have to find a hidden box. The box contains something simple, like a logbook but may contain more items. There are thousands of geocache's all over the country. Visit http://www.geocaching.com or find out more about our geocache - can you find it? Bristol has won the Outstanding Achievement Award in this year's Fairtrade Fortnight Awards following a campaign in which the Bristol Fairtrade Network partnered with the Diocese of Bristol. A key event in the Bristol Fairtrade Fortnight was the Bishop's Brew, a fairtrade tea party for leaders in the city hosted by Bishop Mike, raising awareness of fairtrade issues. Bishop Lee also hosted a Bishop's Brew in Swindon. A Fairtrade fashion show was also pioneered in previous years in partnership with Bristol Cathedral. 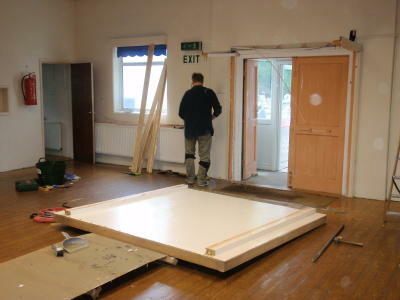 Funding for the installation of the Church Hall suspended ceiling was grant aided by South Gloucestershire Environmental Body and Westerleigh Parish Council. The hall now looks fantastic - do come and see it! The servicing of the Tower Clock was part funded by South Gloucestershire Council. The servicing went very well. We are grateful for their help. Congratulations to the Revd Howard V Smith on his ordination. Howard is now Assistant Curate to The Fromeside Partnership of Churches. Hi. Just a quick reminder that our Sunday morning Service Times are now: 8am, 9:30am and 6pm. See you there! 2nd Sunday - 9:15am Breakfast Club (in hall). Starts 15 mins before the service! 5th Sunday - 10:00am Partnership Service (rotating at St Saviours, St Michael's, St Peter's and All Saints') - always at 10am. NB. Breakfast Club starts 15 minutes before the service to allow time for the children to eat breakfast, have a story and make crafts. We have a parents rota, but please feel free to stay and help, or to join the service. Thanks to Shirley, Sean and Mary (and all the parents) for their help in running this. We have added lots of sermons and prayers to the website and will keep adding to this. To fit in with our new Partnership Churches and ensure we can have sustainable Ministry, we are changing our Sunday Morning service times. From 3rd October our Sunday Morning service will start at 9:30am (instead of 10am). This is the only service time affected (our other Sunday services will still be at 8am and 6pm). Please note however that the 5th Sunday is a Partnership Service (rotating at St Saviours, St Michael's, St Peter's and All Saints') and this will always start at 10am. 2nd Sunday - Breakfast Club (in hall). Starts 15 mins before the service! 5th Sunday - 10am Partnership Service (rotating at St Saviours, St Michael's, St Peter's and All Saints') - always at 10am. All events start at the same time as the service (currently 10am, but moving to 9:30am), except the Breakfast Club which starts 15 minutes before the service (9:45->9:15) to allow time for the children to eat and make crafts. Please feel free to stay and help, or to join the service. 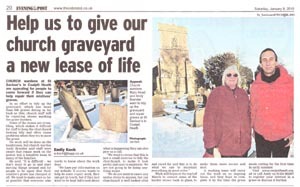 We are going to tidy up & repair some of the graves in our churchyard. Graves are really the responsibiliy of the family, but there is a limited amount of work that we can do. 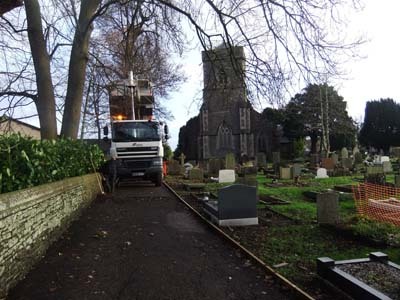 If you are already looking after a grave or do/don't want us to look at a particular grave, then please let us know. This article appeared in the Evening post. We are in the process of acquiring a voice recorder to record our services. If anyone would like a copy of the service (on a regular or one-off basis), perhaps because of illness or holidays, then please let Andy know. Mary is going to run a Tot's Praise service for all the pre-school children at 9:30am on the first Wednesday of the month (during term-time, starting in October). There will be refreshments, followed by a short, fun service and craft making time, followed by a snack. All children and parents welcome. For further information, please contact Mary. View the photos when Eileen left for Canada. 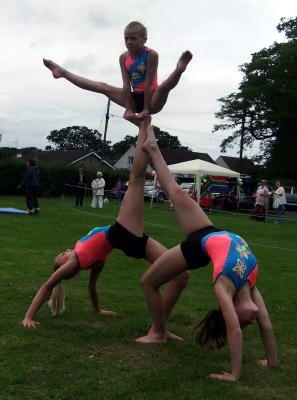 View the photos from our Summer Fayre. The third of our Spotlight interviews is now online; read all about Di's chat with Malcolm Strange. The second of our Spotlight interviews is now online; read all about Di's chat with Martin Clacker. View the video and photos from our 2009 Barn Dance. The first of our Spotlight interviews is now online; read all about Debbie's chat with Colin Lunt. 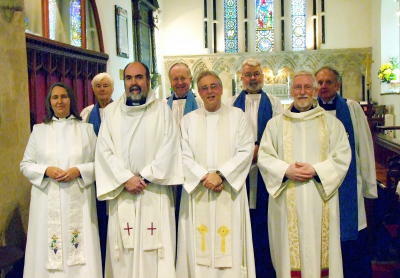 We had a lovely service at St Michael's on 23rd November as part of the new Fromeside Partnership of Churches. We took six different shaped candles to the front to give thanks for all the different ministries in the church and all the good work that people do. It was interesting to note that although they were all different shapes and colours, they all burned brightly with the same flame. It was a delight to see how another church conducts their services. Tea, coffee and biscuits were brought round to everyone afterwards - what service! This month of course marks the start of our Church year and Advent is well under way. We have some special Christmas services and lots of Carol singing planned. The Fromeside Partnership of Churches is now well under way. We had an inauguration service in St Saviour's last month and have our first service together as a partnership on 23rd of this month at St Michael's, Winterbourne. We have also put some of the pictures from Janet Lunt's excellent Earth Connect Exhibition at Frampton Cotterell onto the website. The Ecclesiastical and Civil Parish boundaries of Frampton Cotterell, Winterbourne and Winterbourne Down have now been added to our Parish Boundary map. 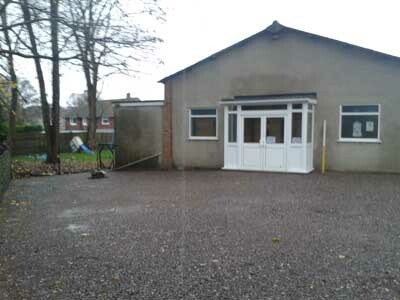 This shows how you can live in one Civil Parish, but in a different Church Parish. All very confusing, so hopefully the map will help sort it out! We have a busy month with our Dedication (birthday) service and the Fromeside Parish Partnership service coming up. It is very exciting to be able to announce the date for the inauguration of the Fromeside Partnership. The service will be held on Tuesday 14th October at 7:30pm at St Saviour's Church. It will be presided over by Bishop Lee of Swindon, supported by the Archdeacon of Kingswood & South Gloucestershire, the Venerable Alan F. Hawker. During this service, the licences of five priests will be extended to cover the four participating parishes. At the same event, the licences of appointed Lay Readers will be extended to operate within the Partnership. 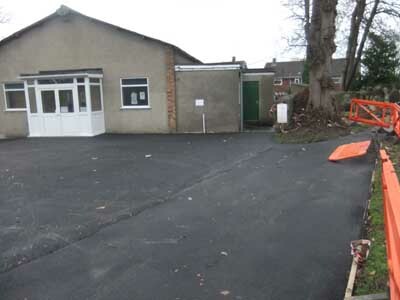 St Peter's Church, Frampton Cotterell have a very good page giving an update on the partnership. Note that this link is to a "Framed" page; once on the page, click on the "St Peter's Home page" link to see the rest of their site. 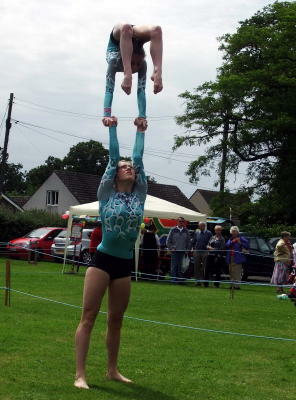 We also have some info on the upcoming event Earth Connect and photos from our Summer Fayre. We are in the process of organising lots of exciting services and events for September and October 2008. Have a look at our services and social pages for more information. At a dedication service on Sunday 13th July in St Peter's Church, Frampton Cotterell, Rev Martin Clacker was licensed as Priest in Charge of the Parishes of Frampton Cotterell, Winterbourne and Winterbourne Down. Rev Jane Tailby, Rev Mark Evans and Rev Malcolm Strange were re-licensed as curates to the three parishes. The service was conducted by the Archdeacon of Malmesbury, the Ven. Alan Hawker and the sermon, about 'Class A' clergy, was preached by Bishop Lee of Swindon. As a parish we would like to extend out warmest greetings to Rev. Clacker and we look forward to working together in the future. We hope all will support the Fromeside Partnership when fully launched later in the year. At this serivce, our own Rev. Colin Lunt will be licensed to officiate at the other churches of St Peter, Frampton Cotterell, St Michael, Winterbourne and All Saints', Winterbourne Down. If you would like to know more about these posts, speak to the Vicar or a member of the PCC. The Parochial Church Council discusses many aspects of the life of the church, and has certain legal responsibilities. It meets about six times a year in addition to the Annual General Meeting at which churchwardens and new PCC members are elected. PCC meetings are open to anyone from the congregation who would like to come, and agendas and minutes are likewise available to anyone on request.